A bit of a show stopper, Gladiolus colvillei rubra has brilliant flowers on tall stems. It is variable in colour, generally strong purples and reds with a splash of white. The flowers appear on tall stems to around 70 to 100cms, flowering time is late spring to early summer. With the long stems, it provides great cut flowers, and planted in a clump it makes a statement in the spring border. This is also a tough plant, drought tolerant and it will cope in full sun to part shade. The flowers do tend to last a little longer in a little afternoon shade. In is found naturally in areas around the Mediterranean, Northern Africa through to Asia. Being so widely spread, the variation in flower colour is to be expected. One established this is an easy care plant. It does require a well drained soil, with at least good morning sun. It is one Gladioli with a strong growth habit, and although the flowers are brilliant in colour, they are smaller than modern cultivars, so rarely does this plant require staking. 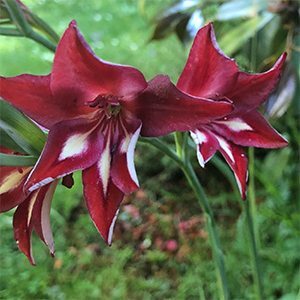 You can also grow Gladiolus colvillei rubra in containers, bring it to the forefront when it flowers for impact. By the time summer gets into full swing, Gladiolus colvillei rubra will be dying back, it is summer dormants and therefore drought tolerant. Simply let the foliage die back and then do a quick tidy up. Mulch lightly adding a little compost if you have it, and this lovely plant will bounce back next spring. This is a plant that is reluctant to set seed, so propagation is by division of bulbs or corms during dormancy.